Dangers abound in Celestia. But nothing ventured, nothing gained. And you plan to venture, as far as your crazy contraptions will take you. 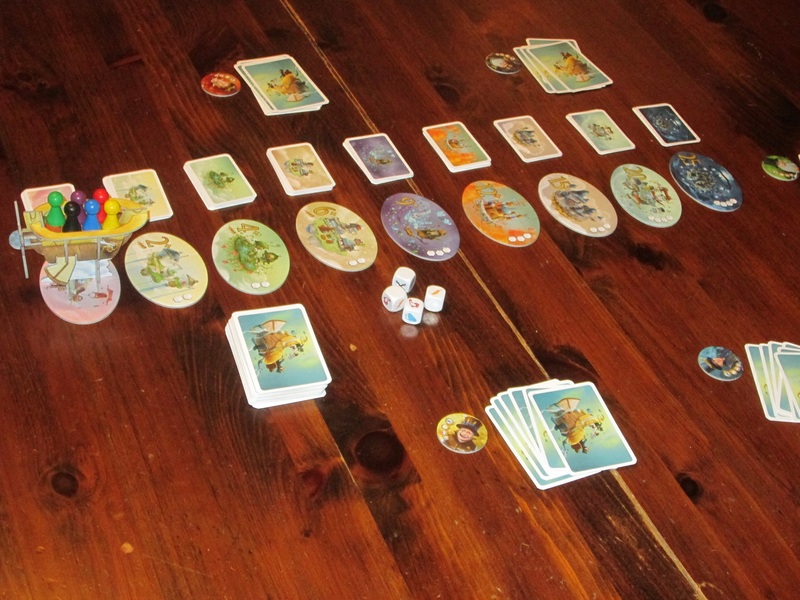 Celestia is a semicooperative push-your-luck/hand management game for two to six players. 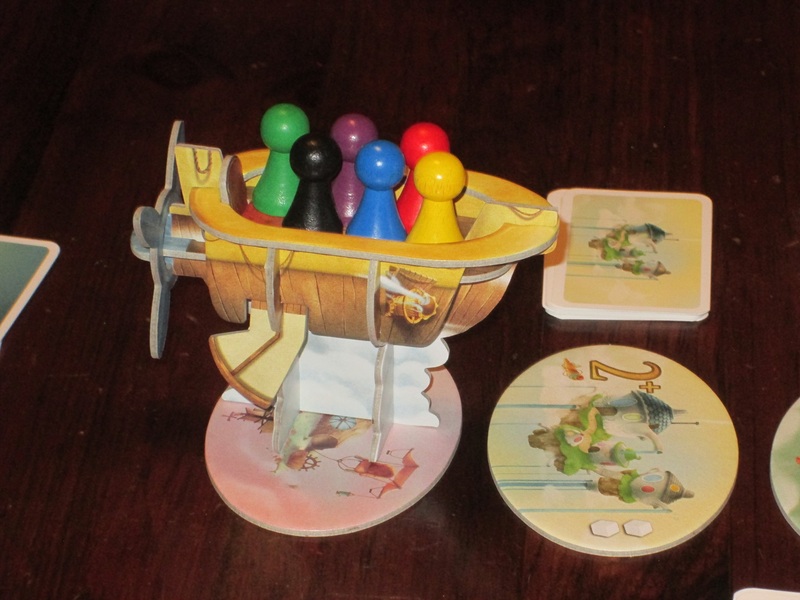 Players are passengers on an airship that must work together to make it to faraway lands and collect points. The player with the most points when at least one player reaches 50 is the winner. Celestia set up for six players. To begin, the numbered islands are placed in ascending order in a row. 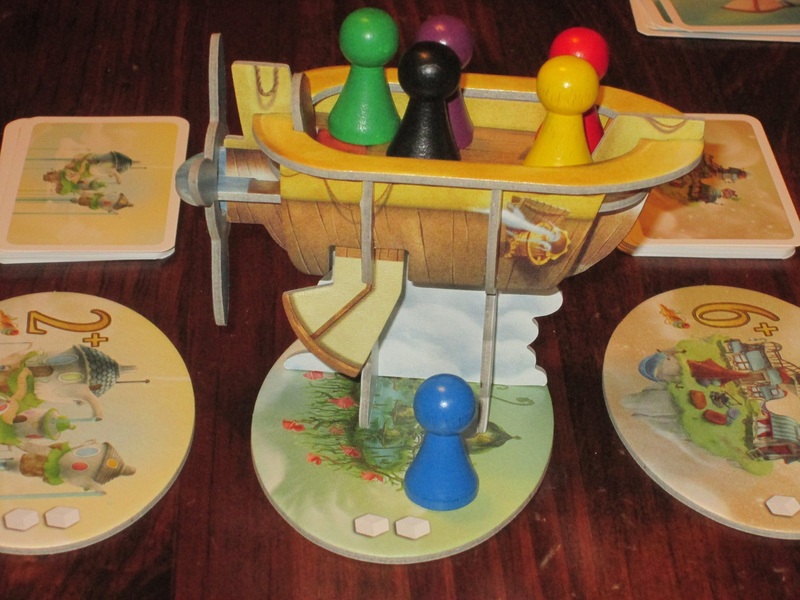 The treasure cards matching each island are shuffled and placed next to each island, and a hand of six equipment cards is dealt to each player. Each player places the pawn of their color in the airship and places the button of corresponding color in front of them. Players choose one player to be the first captain. On a turn, the captain rolls a number of hazard dice corresponding to the next island on the path. Every player that is still in the airship decides, clockwise from the captain, whether they will remain in the ship or jump out, claiming a treasure card from the island where the airship currently is. (The captain may not leave the ship.) 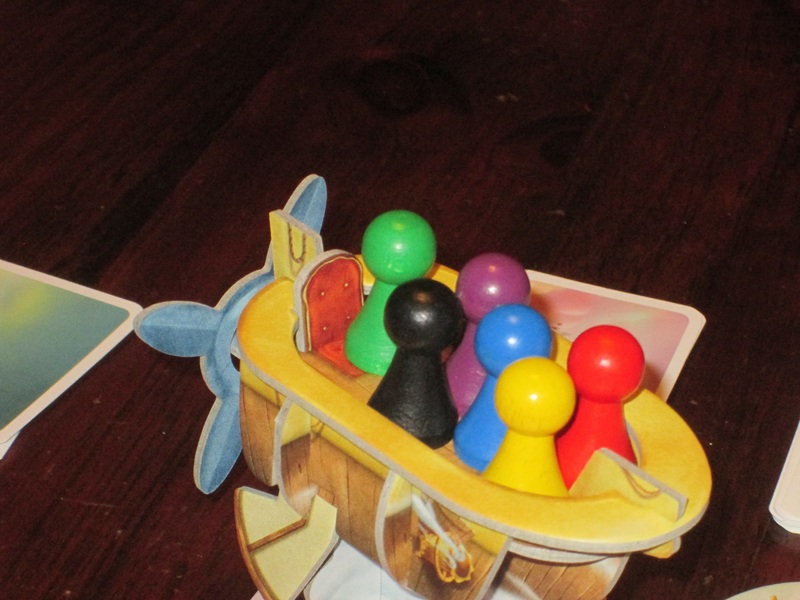 If the captain has the cards to counteract the hazards on the dice, he or she must play them and the ship (and everyone who chose to remain) moves to the next island space, and the next player clockwise who is still in the ship becomes the new captain. If the captain doesn’t have the cards, the airship crashes, and everyone who is still in the ship gets nothing. 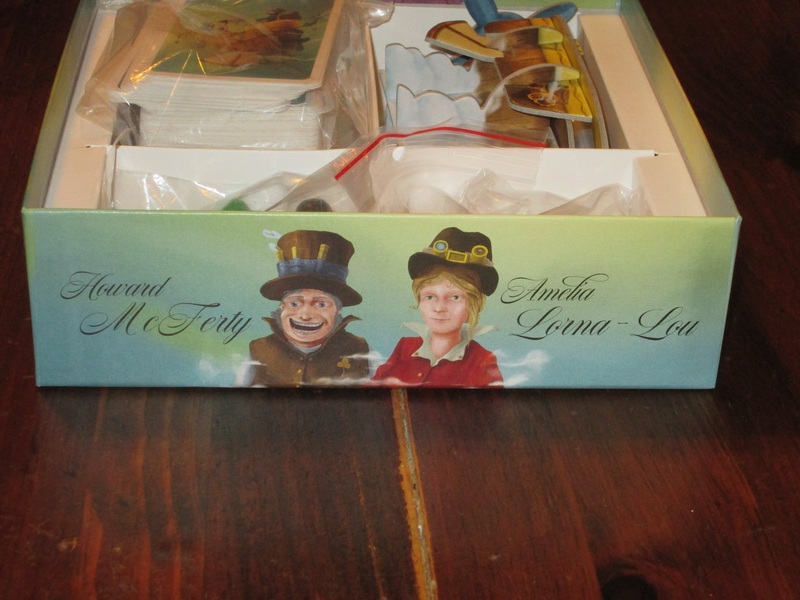 Each player claims a pawn and button noting their quirky adventurer. There are some special power cards included in the deck that let you reroll dice, kick other players off the ship, or make it more difficult for the captain to succeed. There are also wild cards, which the captain is not required to play to meet challenges. The treasure cards corresponding to each island get more valuable the farther the ship goes. 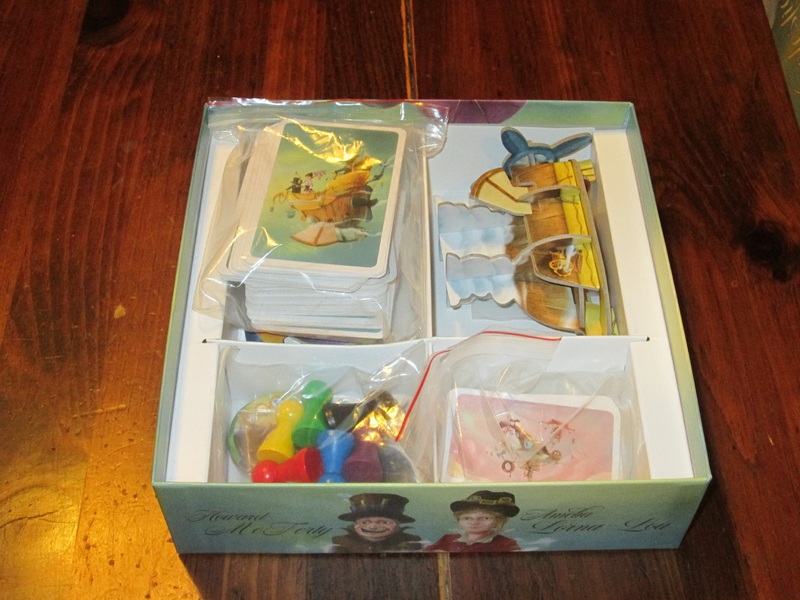 At the end of a round, every player draws a new equipment card and play continues with a new captain. If, at this point, anyone has 50 or more points, the game ends, and the player with the most points wins. A Steady Hand at the Tiller, or Down with the Ship? Push-your-luck games are often simple affairs that hone decisions down to a simple risk-reward binary: should I stay or should I go? And often push-your-luck games are about playing the odds. Celestia delivers on both of these expectations, although perhaps not quite as well as other giants in the genre like Can’t Stop and Incan Gold. But Celestia has something that these other titles lack. It’s more complex, but beyond this, Celestia has charm. Atmosphere. And, it turns out, charm matters a great deal. Yes, Celestia comes with a 3D airship. Is this necessary? No. Is it awesome? Yes. I’ll begin by talking about the components, which are stunning. The completely superfluous (but utterly exciting) airship steals the show here–with its functional, but purely decorative, propeller and well-designed captain’s chair–but it is far from the only thing worthy of comment. Each of the island tiles is beautifully illustrated, and they serve simply as lily pads for the airship, brief stops before the next jump. (The colors could perhaps be differentiated more, which becomes a problem when sorting the game, but this is a quibble.) The treasure cards have similar beautiful illustrations, and once you look at the number, you needn’t look at them again. And the large equipment cards have lavish artwork on them, and all that matters is the symbol in the top corner of the card. All of this is unnecessary but not unwelcome. And in fact, it is this unnecessary chrome that elevates Celestia and propels players into the atmosphere it provides. What elevates (!) 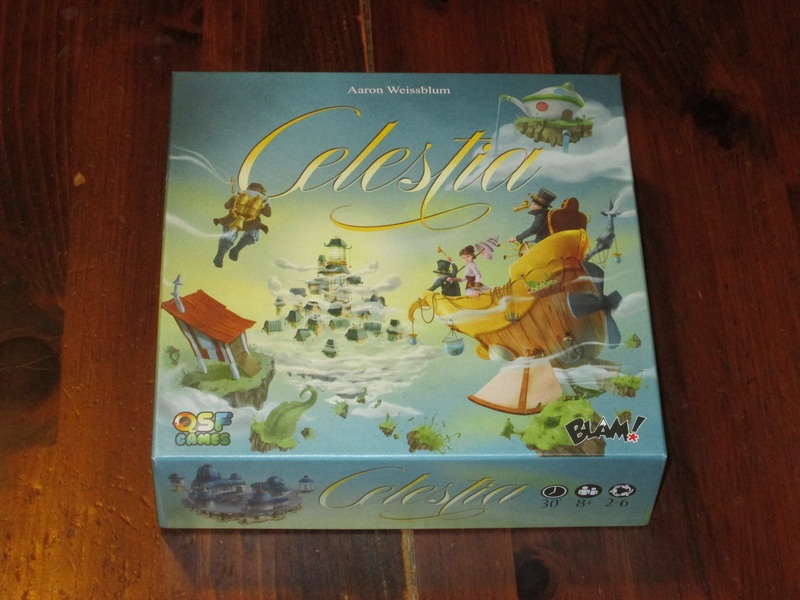 Celestia is the semicooperative nature of the game, and a large part of the game hinges on who’s captain. Can you trust your captain? 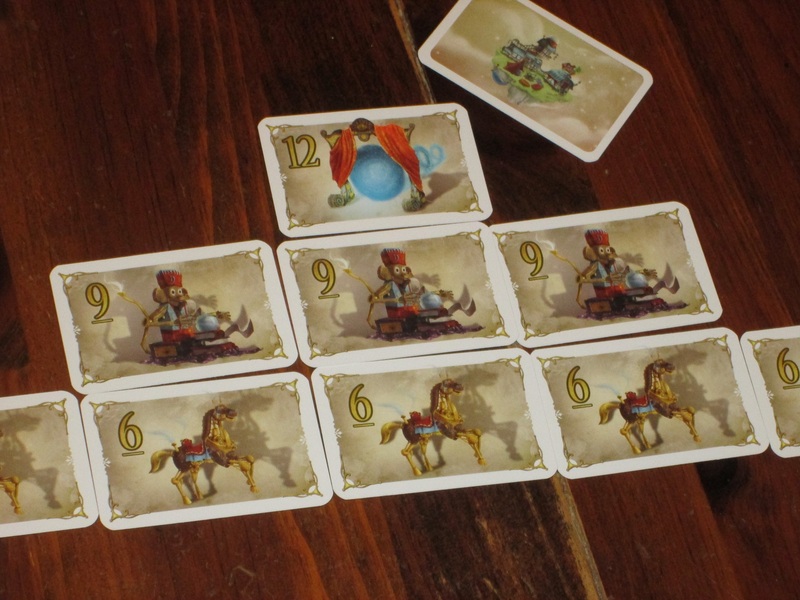 Celestia is an odd entry into the push-your-luck genre because while it does involve playing the odds, the game is almost more about playing the players. Each round, everyone who is not the captain has to give the captain a hard look and ask themselves the question, Is that the face of someone who is about to betray us? There’s some level here of playing the odds–you can see how many cards the captain is holding and judge whether the captain holds the exact combination required. But the wild cards confuse this logic a little. Whereas a captain is required to play the matching equipment if he or she can meet the challenge, the captain is not required to play wilds. So the question becomes not just, Can the captain do it? but Will the captain do it? The captain rolls the included custom dice, each of which is blank on two sides and shows one of the four danger symbols on the other sides. The captain MUST play equipment cards if in hand, but the captain may CHOOSE whether to play wilds. Herein lies the game. Decisions like this don’t always matter (the captain is, again, restricted by the cards in hand), but they are what make every round of Celestia interesting. They force the question, Is the captain holding anything back? And that players are even asking that question points to another departure from what’s expected in push-your-luck games: Celestia is semicooperative. Yes, everyone is playing for themselves, but each player can only go so far on the few cards they hold. If I use my cards as the captain this turn, I’ll have fewer options the next time I’m captain. Players have to depend on each other to propel the airship farther, especially if they want to reach the lucrative later islands. They have to form temporary alliances in order to reach the better treasure. But they also have to wonder if the other players will betray their trust. Celestia, in addition to the wild cards, has some other special cards mixed in its deck that can spice up the game. Ejection cards can kick another player out of the airship. 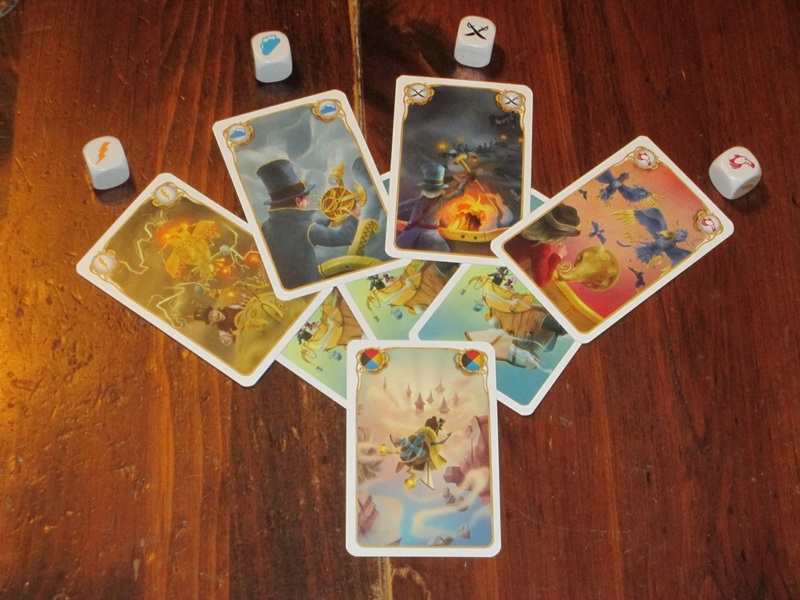 Jetpack cards allow a player aboard a crashing airship to float to the ground in safety, still earning treasure. Path cards allow the captain to reroll dice, hoping for a better (and beatable) result. And wind gust cards, which can be played even by players who aren’t in the airship, can force the captain to reroll blank dice, which may crash the airship. Normally special action cards like this would dilute the experience for me, but there are few enough of them in the deck that I don’t mind them. In fact, I prefer the situations they create (even if I’m the one ejected from the airship). They provide an extra layer of decision making to the game. The treasure cards in the 6 stack. As you can see, that’s quite a spread in terms of points. This might bother some players. As long as this is clear, I think it’s just an additional part of the decision-making process. Was blue ejected or just scared? Or did he have reasons all his own? Whatever the case may be, he has received his reward in full. In Celestia, you’re going places. Green and black have a good thing going–how far can they go? Among these, Celestia is certainly more complex. There are special power cards to understand, a different and sometimes challenging semicooperative flow to consider, and deeper gameplay decisions. (For example, you might jump ship early not because you think the captain can’t make it but because you’re next in line to be captain and either don’t have or don’t want to spend cards.) It takes a little more time to teach and play, but I think it’s worth the effort. In fact, that’s the only thing I can really find to say against Celestia: it’s a quirky push-your-luck game that is harder to teach and a little harder to parse than other games in the genre. But what could be a liability (its quirkiness) Celestia turns into an asset by crafting a unique setting around it with beautiful components. Celestia is a game that benefits from the atmosphere it lovingly creates through the game’s physical pieces. I mentioned that the game is gorgeous, but I love the attention to detail. Each of the characters in the game has a name and personality. Which, like the rest of the window dressing, is completely unnecessary, but not unwelcome. 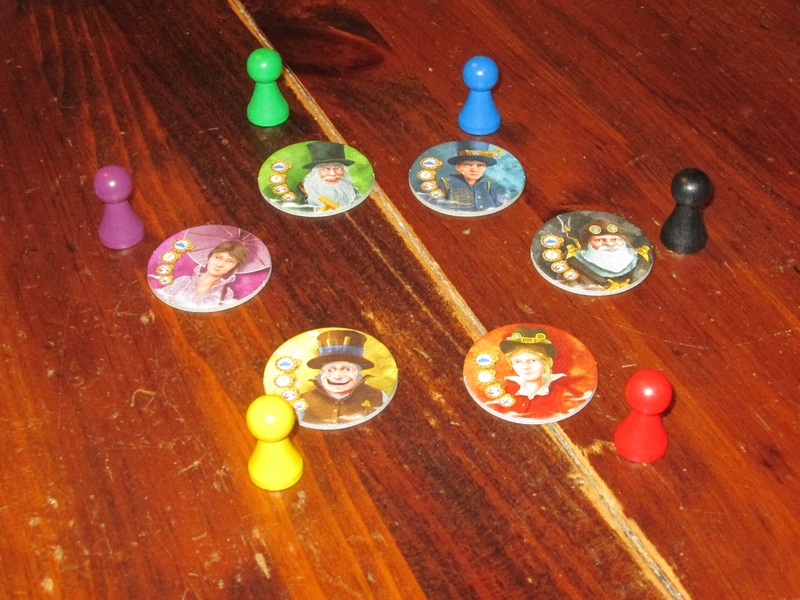 I’ve played Celestia with two, four, and five players, but the player count goes up to six. My favorite among these counts was with five, and I can imagine it would be a blast with six. I still enjoyed it quite a bit at four. The two-player game was surprisingly decent but it was much different from the higher-count games: thinkier and a little meaner. Because you only have one other player in the ship, the game isn’t so much about making temporary alliances but about capitalizing on the opportunities when your opponent jumps out (or is ejected from) the airship. The hand management is even more crucial, even if the game isn’t as exciting. My wife played the two-player version with me twice, and she didn’t like it (although she said she thinks she would with a larger group). I was fine with the two-player version, but I wouldn’t buy it based on that mode alone (and probably won’t play with two or even three players again). The insert. Not the greatest, but functional enough. 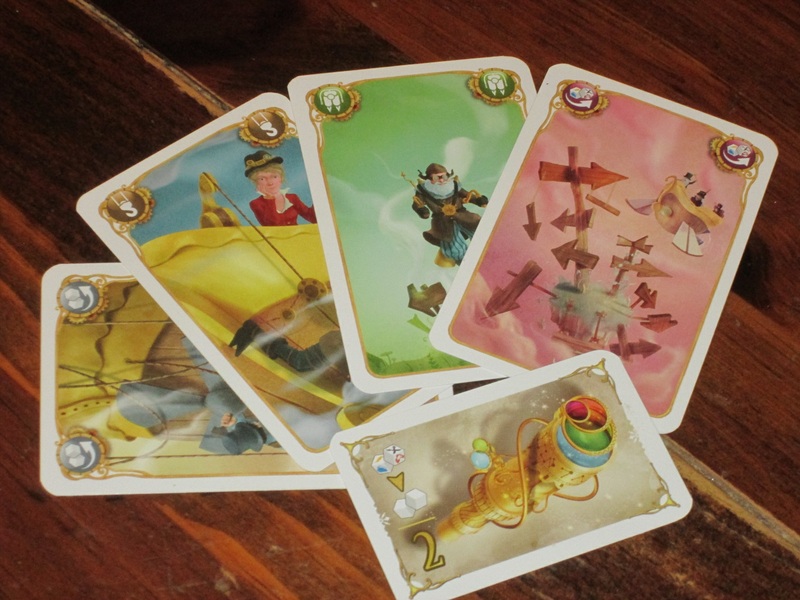 If you’re looking for an exciting filler game (push your luck or otherwise), Celestia is a great choice. 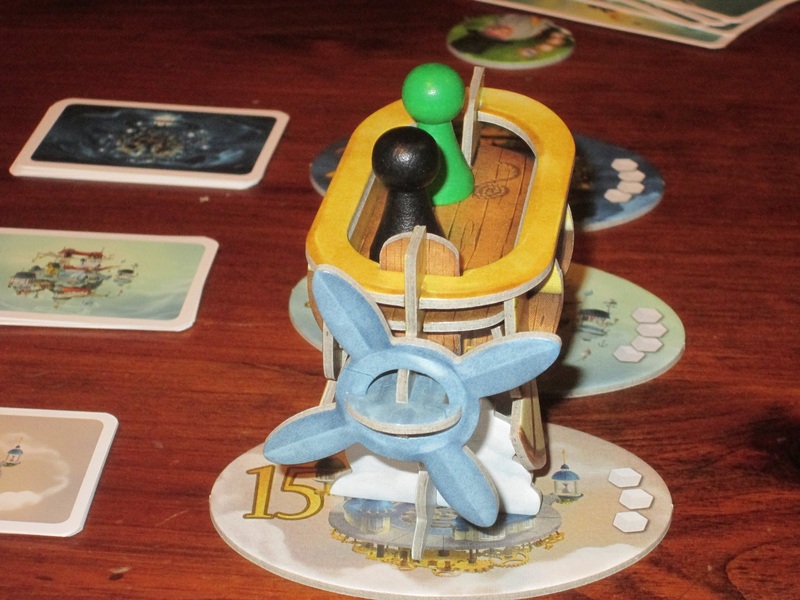 It has charm, beautiful components, and an interesting conceit that’s quite unlike anything else I’ve played. It doesn’t overstay its welcome, and while it is more complex than other pure push-your-luck games, the semicooperative play and interesting hand management decisions make it worthwhile to expend the extra teaching effort. I’ve brought this out at several groups now, and even though it was played as the opener or closer among some harder-hitting games, it has stood out as the memorable game that my friends are asking to play again. And I’m happy to oblige them in their request–so long as they don’t crash the airship. iSlaytheDragon would like to thank QSF Games for providing us with a review copy of Celestia.